Hillary supports a clear path to legal citizenship for immigrants. We’re a country of immigrants – always have been. It’s our legacy and our DNA. It’s also part of what makes us great. It energizes us culturally and financially. As a Senator, Clinton co-sponsored the Safe, Orderly, Legal Visas and Enforcement Act of 2004 with Sen. Edward Kennedy. She co-sponsored the Dream Act in 2003, 2005 and 2007, which helped give immigrant students access to higher education and supported the Comprehensive Immigration Reform Act in 2006 and 2007. Hillary’s pledge not to deport any illegal immigrants except violent criminals and terrorists while we fix the system and create a path to citizenship represents a major break from President Obama, and it could vastly increase the number of people who would be allowed to stay in the country. For those who think this is problematic, immigrants actually contribute to the employment of US citizens rather than take jobs, in part, because so many are small business owners – they employ more people than the jobs they take. In fact, the share of immigrant workers who own small businesses is slightly higher than the comparable share among US-born workers; they are 18% of small business owners. Additionally, immigration reduces the federal budget deficit – they contribute to Social Security and pay taxes — about $12 billion a year (more than some presidential candidates, in fact) and, until/unless they become residents, never recoup that money. Immigrants also increase U.S. economic output because they are disproportionately likely to work and are concentrated among prime working ages. Despite being 13% of the population, immigrants comprise 16% of the labor force. • End the three- and 10-year bars that force families whose members have different citizenship or immigration statuses—into hard choices of leaving or hiding. • Defend Deferred Action for Childhood Arrivals (DACA) and Deferred Action for Parents of Americans and Lawful Permanent Residents (DAPA) laws. • End family detention and close private immigration detention centers. • Let families—regardless of immigration status—buy into the Affordable Care Act exchanges. • Expand fee waivers to alleviate naturalization costs, increase access to language programs to encourage English proficiency, and increase outreach and education to help more people navigate the process. • Create a national Office of Immigrant Affairs to increase federal resources for adult English language education and citizenship education. As an aside, net immigration from Mexico is 0 – as many Mexicans leave the US as come in each year. If we want to build a wall, we have to build it in JFK as most immigrants come from Europe and 46% of them have white-collar jobs – kind of like Melania. Day 93 – My journey to find reasons to vote for Hillary rather than just against Trump. This post is going to be hard to write without going negative (I promised, and I’m a woman of my word), so bear with me. There is a lot of talk about “Constitutional judges” and “originalism,” which references the desire to interpret the law based on how the original framers of the Constitution would have. In my opinion, this is problematic in a few ways; primarily: the writers of the Constitution could not have predicted today’s world: copyright law, privacy issues, global relationships, the capabilities of today’s guns, as well as all the cultural changes. So, I think their words are ill equipped to accommodate the massive changes in the world. This means we’re left with imagining their intent. 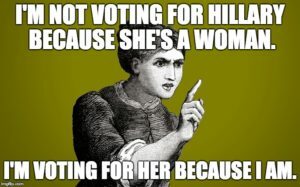 Everything in Hillary’s agenda seems to support the rights of the individual to thrive in today’s environment: it is about choice: to vote, to marry, to control their own bodies, without restricting anyone else. While I, of course, would like to see the 2nd Amendment overturned, Hillary does not. (I know, I know, I will never win this one.) So, even the restrictions I might like to see are not included in her plans (making her something of an originalist) and keeping it about choice. Sigh. For those conservatives who are supporting Trump only because of the Supreme Court, please read the analysis provided in The Atlantic article I included below. It sheds some light on specific rulings that you might care about and a liberal court’s effect on originalism.